Louder than War’s Ioan Humphreys gets to listen to the new solo LP from experimental composer and NY No waver, Truus de Groot. Either as a solo performer, or under the Plus Instruments moniker, Truus de Groot has been at the forefront of experimental music-making for the last three decades. Established in 1978 in the Netherlands, amidst the explosion of punk rock and new wave, de Groot became active in the resulting detritus of the scenes. However, the more experimental aspects of tinkering with toy instruments, mangled improvised sounds, and in particular, analog synthesizers gradually took over and moved de Groot’s sound beyond post-punk, and thus Plus Instruments was born. Releasing their first EP single in 1979, most of Plus Instruments’ live performances were improvised, and after hundreds of performances all through Europe, Truus struck up a friendship with Rhys Chatham’s drummer, David Linton after seeing them play live in her hometown of Eindhoven. This friendship with Linton involved an invitation for a NYC visit in 1981, where de Groot was suddenly thrown into the burgeoning and incredibly fertile No wave scene. There, Plus Instruments would soon include Lee Ranaldo (Sonic Youth) on guitar and David Linton on drums, while Truus played bass and sang lead vocals. They quickly recorded and released an album, February – April 1981, on the Dutch Kremlin label. With this line-up, they hit the New York club scene, and went on to a European Tour. Over the coming years, Plus Instruments would include musicians such as Jonathan Schneider, Craig Kafton, Annene Kay, Marula Verbeek and James Sclavanos (Sonic Youth, Bad Seeds), yet de Groot remained the constant in this fluid, experimental outfit. 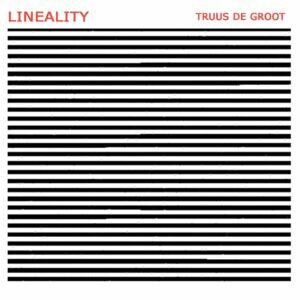 December 2017 saw the latest release from de Groot, in the form of the six-track LP, Lineality. Each of the six tracks runs to exactly eleven minutes and it is described by de Groot herself as, “my most experimental album to date”. The full-length album was created solely using her own analog synthesizers, co-designed by Bosko Hrnjak and built by Dr. Moonstien. Immediately from Lineality 1 (Primam Aciem), the widescreen scope of the sounds that de Groot is able to makes is unnervingly evident – wonky analog synth drone, with audial cosmic arrays and modulator bends. Halfway through the track, a throbbing synth beat emerges, only to be beaten down by the experimental warped sounds. Lineality 2 (II Recta) starts off with a more organic feel. At times it sounds like field recordings and not the results of any electrical involvement. As the track progresses, the spacial architecture De Groot is able to make with her sounds becomes especially evident, as you could imagine these are the last sounds a dying spacecraft would make as it plummets into a planet. Lineality 3 (Tertiam) has the spastic modular bends, ramped up as the other-worldly sounds she is able to produce become more and more outrageous and astonishing. A heavy, unnerving march underlies the track and you could well imagine it playing out to the march of a Triffid, or worse. The second half of the track is taken up with a more noisy experimental feel, albeit accompanied with what sounds like a deranged oboe. Nice. Lineality 4 (Quarta Acie) has quite a harsh, high-pitched noise start and is closely followed by another drone-heavy slog through the gorgeously-twisted frequencies, sinister heavy throbs, spectral ripples and celestial rip tides. Ironically, it is out of this unearthly electronica swamp that comes the first thing that remotely resembles a ‘tune’ in the most conventional terms. Follow-up, Lineality 5 (Linea Quinque), is another track that trudges through a sonic scrap land soundtracking decrepit and outsourced robots, sending out final distress signals as they head to the crusher. It’s pure modular synth hedonism and de Groot sounds like she is having the time of her life making these tracks. Final track, Lineality 6 (Tandem Lineam) starts off a more gentle affair than the previous tracks and sees de Groot veering into Max Richter-esque territory. That is until the equilibrium is once again upset and the sonic ground you were walking on changes like an Escher painting. Again, the sounds created are unsettling, jarring and disconcerting. But they make perfect sense. Equal parts musique concrete and The Quatermass Experiment, Lineality is unnerving and creates disquiet, but never discomfort. This sort of territory is left to the ‘harsh noise’ makers. Instead, what de Groot does so perfectly is mine the depths of sonic possibilities with a masterful knowledge of modular synth to create vast amounts of space and time in which to paint her sounds. Experimental and abstract, yet beautifully distracting (and even comforting) in this increasingly weird and hostile world. Gorgeous stuff. Truus de Groot can be found via her website and Facebook.